Stone Soup is the beloved international magazine of writing and art by children, founded in 1973. Stone Soup’s four decade tradition of publishing inspiring stories and poems, thoughtful book reviews, and sparkling artwork by kids continues online. 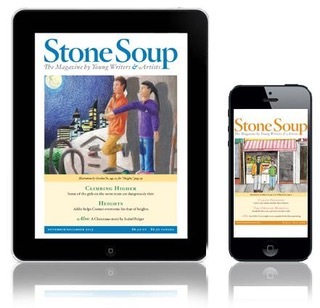 As of July 2017, Stone Soup is published online eleven times per year: monthly from September through June, with a combined July/August issue. You can browse online at our website or download one of our apps and read offline at your leisure. Twenty years of back issues are also available for reading online as part of your subscription – every story, every poem, every book review published. Stone Soup is published by the Children’s Art Foundation, a 501(c)(3) nonprofit educational organization. Take advantage of our great new rates as we launch Stone Soup online! Teachers! You may want to purchase a site license, with access for your entire school. Learn more here.